In my previous post I introduced the brewing project to analyze Saccharomyces eubayanus as a brewing yeast. After collecting all of the data, they were analyzed using a concept known as design of experiments (DOE). Without delving into theory, the effects of multiple factors (e.g., starting gravity, mash temperature, mash time) on an output (e.g., attenuation) can be easily analyzed. Rather than analyzing the 10 different starting gravities (e.g., 1.025 to 1.070) mashed at eleven temperatures (e.g., 145-155°F) for three different times (e.g., 60 min, 90 min, 120 min) for a total 330 mashes, conditions can be randomized for a smaller experimental set, say 20 mash conditions, to generate a statistical response model to predict how these variables interact. In total, data from 49 beers representing 25 beer styles were submitted and analyzed. Brewers recorded data for every aspect of their brewing process: recipe details, mash/steeping temperature, mash/steeping time, fermentation temperature, fermentation time, starting gravity, finishing gravity, yeast starter method, wort oxygenation method, and diacetyl detection. While this experiment might be criticized for having too many uncontrollable variables, I argue that having the uncontrollability of multiple brewers actually helps control the entire experiment. If a trend emerged for a particular output, perhaps a phenolic flavor for example, definite characteristics of the yeast can then be made. Further, the performance of the yeast would be evaluated in real-world brewing scenarios, thereby demonstrating its practical utility as a brewing yeast. Factors that impact attenuation were analyzed by first separating entries based on whether the brewers used malt extract or performed an all-grain mash. Eight beers were brewed partially or entirely with malt extract. Excluding a single outlier with 29.6% attenuation, the mean attenuation of these beers was 61.8% +/- 7.3%. Only one of these had fermentables from a mini-mash (6.2% Munich malt steeped at 150°F), and this had no noticeable effect on attenuation. No correlation could be made between the fermentation temperature and attenuation as the beer with the highest attenuation (74.5%) fermented at 70°F and the beers with the lowest (50% and 58%, again discounting the 29.6% beer) fermented at 67°F and 68°F. The mean attenuation of the all-grain beers was 64.7% +/- 11.1%. Of these, six attenuated 40-50%, four attenuated 51-60%, twenty-one attenuated 61-70%, seven attenuated 71-80%, one attenuated 82% and one attenuated 89%. The highest attenuation is most likely due to a 5 hour mash that started at 142°F and ended at an unknown, but much cooler temperature. The data for the all-grain beers were imported into JMP 11 software 5 to analyze the impact of the mash temperature, mash time, original gravity, percent specialty grains, fermentation temperature, and IBUs (since hops can inhibit yeast growth) on attenuation. The impact of an individual effect in the context of the other effects on attenuation was analyzed using leveraging plots (Figure 1). The confidence curves (red dashed lines) indicate the significance of the effect on attenuation; curves that cross the blue line are considered significant. These data show that only the mash temperature has a significant impact on attenuation where a low mash temperature yields a more fermentable wort. The mash time, original gravity, and IBUs had no impact on attenuation and the fermentation temperature and percentage of specialty grains had borderline impacts. The impact of the mash temperature on attenuation is not entirely surprising. Several groups have reported that, unlike S. cerevisiae, S. eubayanus lacks a maltotriose transporter (1, 2). Since lower mash temperatures generate less maltotriose molecules than higher mash temperatures, a more fermentable wort is achieved at low mash temperatures. In the model, fermentation temperature had a borderline impact on attenuation. While an early report showed S. eubayanus does not ferment or grow very well at 72°F (1), a recent paper demonstrated that not only does S. eubayanus grow and ferment up to at least 86°F, at 68°F it grows and consumes sugars faster than S. cerevisiae (2). 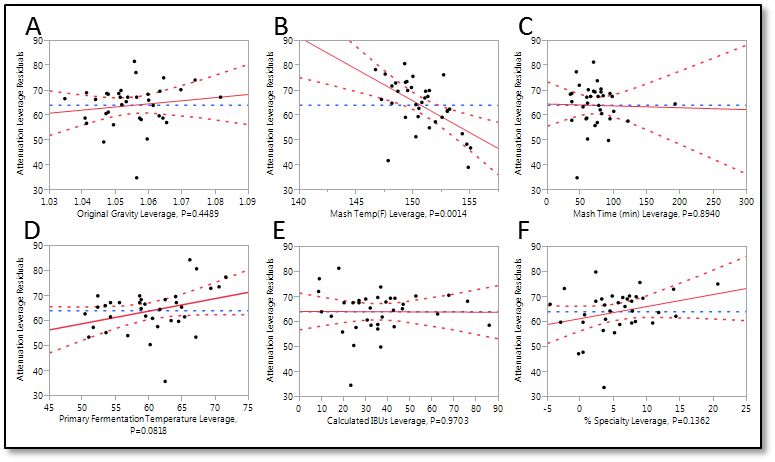 The data from these beers support the latter observation where multiple brewers demonstrated attenuation >80% at temperatures above 68°F. Both reports were in agreement that S. eubayanus grows well at low temperatures, and consistent with these reports, attenuation as high as 70% was seen by multiple brewers at 50-54°F. In summary, S. eubayanus requires a wort produced from a low temperature mash containing few specialty malts to achieve high attenuation. The fermentation temperature had little impact on attenuation, allowing brewers to ferment over a wide range of temperatures. ll above the flavor detection threshold, which may account for the white wine-like flavors and aromas prevalent in a lot of the beers. A majority of the beers also had detectable levels of diacetyl. Acetaldehyde hovered between the range of flavor detection thresholds, and may have contributed to the apply flavors in the beers. Surprisingly, the levels of ethyl hexanoate and ethyl octanoate were below the threshold of detection in most samples, as these typically contribute to fresh-apple flavors. Perhaps S. eubayanus produces apple-like esters not typically produced by S. cerevisiae or S. pastorianus, and are therefore not part of the panel of compounds analyzed in beer. 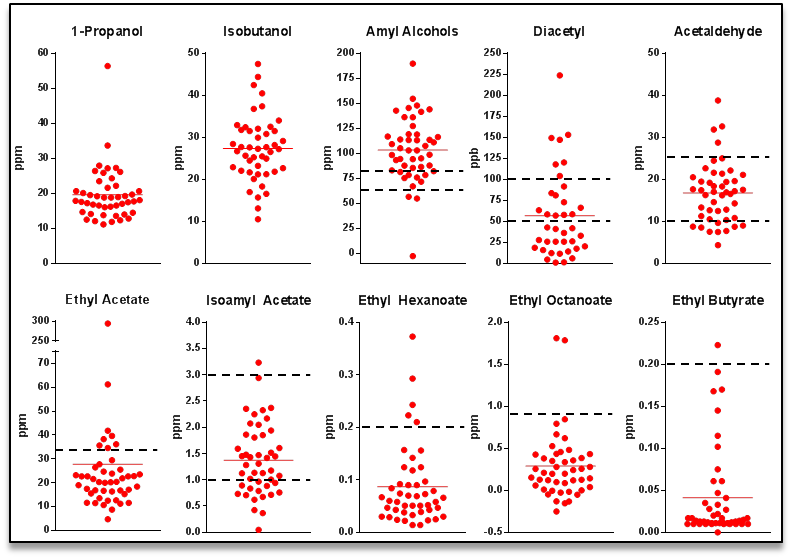 Ethyl acetate was detectable in most all beers. One beer in particular had an extreme level at 294 ppm. This beer was also the lowest scoring beer, and was described as cidery and astringent. The levels of isoamyl acetate were on the low end of detection, and likely contributed to some of the fruitiness, though no beer had an overt banana character (a large criticism in the Hefeweizen category). Ethyl butyrate was for the most part well below the threshold of detection. 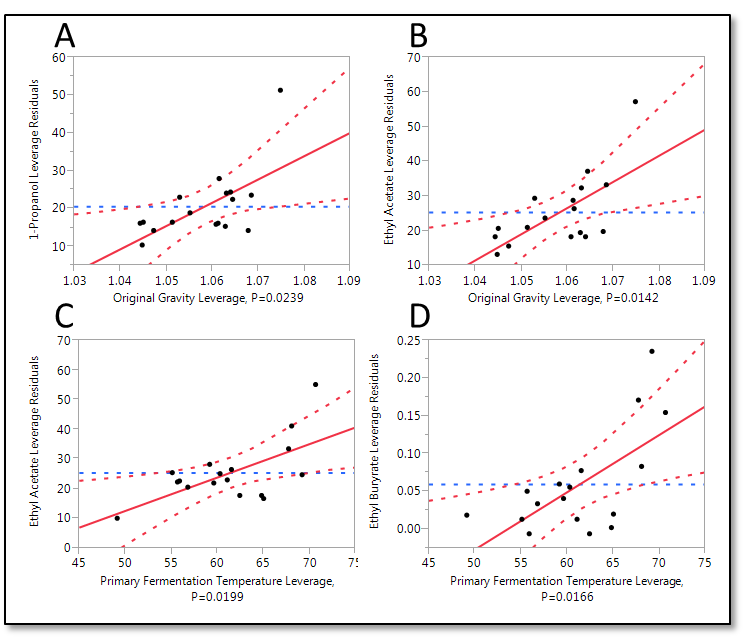 The influence of the original gravity, fermentation temperature, and fermentation time on the levels of all the compounds was analyzed by leveraging plots. Only ethyl acetate and 1-propanol were influenced by the original gravity. As the original gravity was increased, the levels of both tended to increase (Figure 3). The levels of ethyl acetate and ethyl butyrate also tended to increase as the primary fermentation temperature increased. No other compound appeared to be influenced by any other factor. The mean values for each compound were compared to those published by Gibson et al. (1) and Mertens et al. (3) (Table 2). Overall, the data were consistent. These groups demonstrated that compared to S. cerevisiae and S. pastorianus, S. eubayanus produced similar or less amounts of acetaldehyde, and these levels were similar to the beers in this study. They also found similar amounts of higher alcohols (1-propanol, isobutanol, isoamyl alcohol) between the three species of yeast. The beers in this study, however, had much greater levels of amyl alcohols than what these groups reported. The levels of ethyl acetate, isoamyl acetate, and ethyl butyrate were similar between yeast in all of the studies. Gibson et al. reported the esters ethyl hexanoate and ethyl octanoate were 0.2-0.3 ppm higher than S. cerevisiae and S. pastorianus. However, the levels in our beers were similar to those seen in S. cerevisiae and S. pastorianus. Continue reading for results of the beer judging. 1. Gibson, B. R., Storgards, E., Krogerus, K., and Vidgren, V. Comparative physiology and fermentation performance of Saaz and Frohberg lager yeast strains and the parental species Saccharomyces eubayanus. Yeast 30(7), 255-266. 2013. 2. Hebly, M., Brickwedde, A., Bolat, I., Driessen, M. R., de Hulster, E. A., van den Broek, M., Pronk, J. T., Geertman, J. M., Daran, J. M., and Daran-Lapujade, P. S. cerevisiae x S. eubayanus interspecific hybrid, the best of both worlds and beyond. FEMS Yeast Res 15(3). 2015. 3. Mertens, S., Steensels, J., Saels, V., De, Rouck G., Aerts, G., and Verstrepen, K. J. A Large Set of Newly Created Interspecific Saccharomyces Hybrids Increases Aromatic Diversity in Lager Beers. Appl.Environ.Microbiol. 81(23), 8202-8214. 2015.